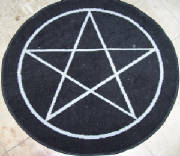 This carpet is 3' feet diameter with a silver pentagram on a black background. Carpets are made with 100% jute backing and heavy duty weaving. (real deal carpet, not just a throw rug). Colors won't bleed or fade with use. A square black velvet cloth (38" x 38") with LARGE Pentagram (21") that reflects light back. Fits snuggly on a standart card table. Awesome! The Ankh is a symbol for the power to give and sustain life, the Ankh is typically associated with material things such as water(which was believed by Egyptians to regenerate life), air, sun, as well as with the Gods, who are frequently pictured carrying an Ankh. The 12 symbols of the zodiac with stars and moons. A beautiful celestial carpet that warms any house with its rich colors. A fine quality carpet that will last a long time. 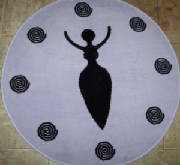 "...widely held beliefs that Kokopelli was a fertility symbol, roving minstrel or trader, rain priest, hunting magician, trickster, and seducer of maidens..."
Strong quality rug with jute backing.